Genuine soft Arkansas Novaculite whetstone is permanently mounted on a hand crafted Cedar Paddle with a tied leather lace for hanging. 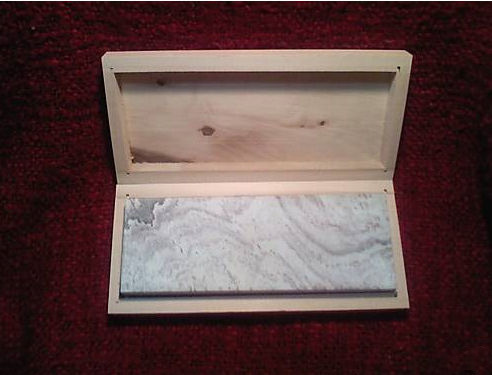 Stone Size 3" X 1" X 1/4" 4" X 1 5/8" X 3/8"
6" X 1 5/8" X 3/8"
Stone Size 7" X 1 5/8" X 1/2"
Genuine Arkansas Novaculite Whetstone permanently mounted on a beautiful, hand crafted, hardwood base. 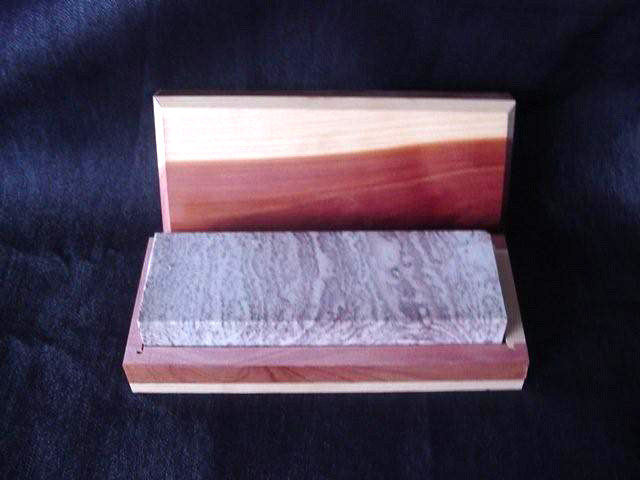 Stone Size 4 1/4" X 1 5/8" X 1/2"
This Stone and Oil Bench Stone Combination comes with a soft and a hard Arkansas whetstone stored in a beautiful hand-crafted cedar or hardwood box, along with a 3 oz. bottle of environmentally safe premium honing oil. This NEW 1/2" THICK Soft Novaculite Sharpening Stone (approx. 400 grit) is the REAL McCoy! This is a Genuine Arkansas Soft Novaculite Whetstone mined ONLY from the Ouachita Mountain region of Central Arkansas. This is the finest knife sharpening material in the WORLD! This stone can put a quality edge on any blade. It measures a full 8" x 3" x 1/2" and comes in a BEAUTIFUL Hand Crafted Cedar or Hardwood Box. If you are looking for a TRUE Best Quality Novaculite sharpening stone that will last a LIFETIME, this is it! Makes for a GREAT GIFT! Three sizes are available for this 8" long hard stone: 1/2" or 3/4-1" THICK, or stone size of 8" x 2" x 1/2". This Hard Novaculite Sharpening Stone (approx. 800 grit) is the REAL McCoy! This is a Genuine Arkansas Hard Novaculite Whetstone mined ONLY from the Ouachita Mountain region of Central Arkansas. This is the finest knife sharpening material in the WORLD! This stone can put a quality edge on any blade. It is packaged in a BEAUTIFUL Hand Crafted Cedar or Hardwood Box. If you are looking for a TRUE Best Quality Novaculite sharpening stone that will last a LIFETIME, this is it! 8" x 3" x 1/2"
8" x 3" x 3/4-1"
GREAT GIFT! - This ALL AMERICAN MADE Arkansas Novaculite Whetstone sharpening kit comes with three (3) 6" x 2" x 1/2" Genuine Arkansas Novaculite Whetstones. 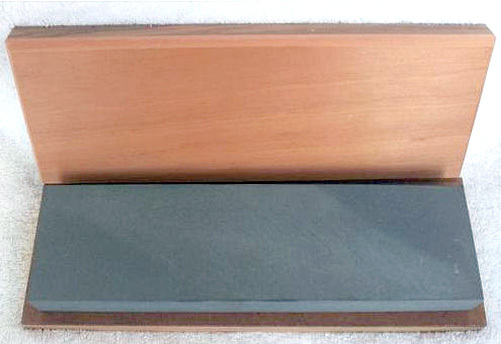 One bench stone is soft Novaculite for sharpening and polishing. Another is a medium Novaculite stone for putting a sharp edge that can only be achieved with an authentic Arkansas Novaculite whetstone. The final stone is rare and expensive BLACK Arkansas Novaculite stone for achieving a surgical quality razor sharp edge like no other sharpening stone can. Included in this kit is a 4 oz. bottle of superior, environmentally safe and FDA approved honing oil. 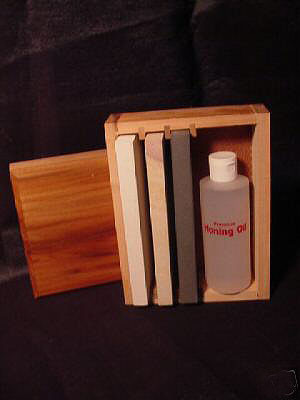 The whetstones and oil come packaged in a beautiful handcrafted hardwood or cedar box. This makes a perfect gift for the Outdoorsman or Chef who want to put and keep the sharpest edge possible on their kitchen or hunting knives. 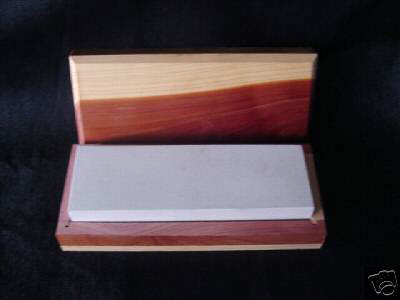 6' X 2" X 1/2"
This NEW (one) 1" THICK Novaculite Whetstone Sharpener is made up of (2) TWO 1/2" thick authentic Arkansas whetstones fused together. (1) One side is a soft novaculite stone for starting an edge on a dull blade. The other side is genuine black novaculite for finishing with a surgical quality edge. This two sided sharpening whetstone is TRUE Genuine Arkansas Novaculite mined ONLY in the Ouachita Mountains region of Central Arkansas. True Arkansas novaculite is considered to be the finest knife sharpening material in the WORLD! This Dual-Stone sharpener can put a superior quality edge on any blade. The full stone comes in two sizes: 6" x 2" x 1" or 8" x 2" x 1". It is packaged in a BEAUTIFUL Hand Crafted Cedar or Hardwood Box. If you are looking for a SUPER Best Quality Novaculite dual-stone sharpener that will last a LIFETIME, this is it! Also, makes for a GREAT GIFT! 6"' X 2" X 1"
This 3/4-1" Thick Hard Novaculite Sharpening Stone is the REAL McCoy! This is the Genuine Arkansas Hard Novaculite Whetstone mined ONLY from the Ouachita Mountain region of Central Arkansas. This is the finest knife sharpening material in the WORLD! This bench stone can put a quality polished edge on any blade. It is available in two lengths and comes in a BEAUTIFUL Hand Crafted Cedar or Hardwood Box. 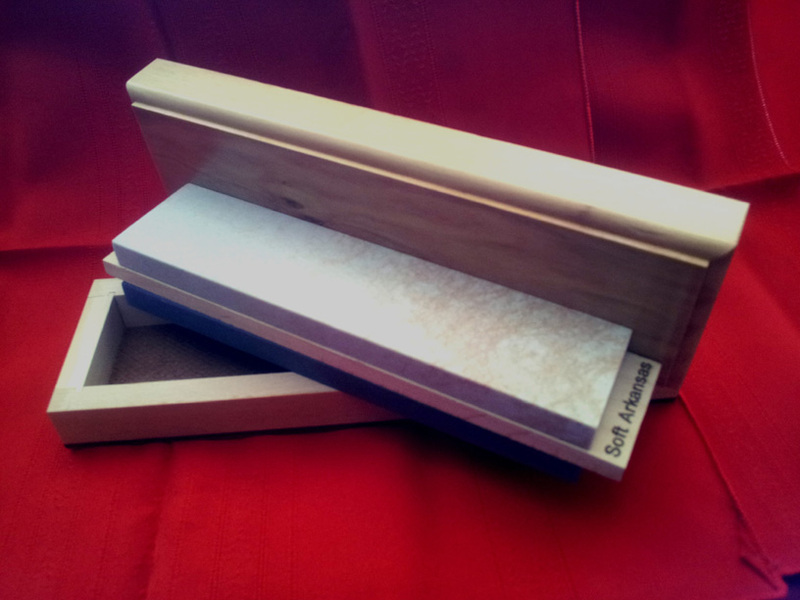 If you are looking for a High Quality sharpening stone that will last a LIFETIME, this is it! This stone is approximately 800 grit and makes a GREAT GIFT! 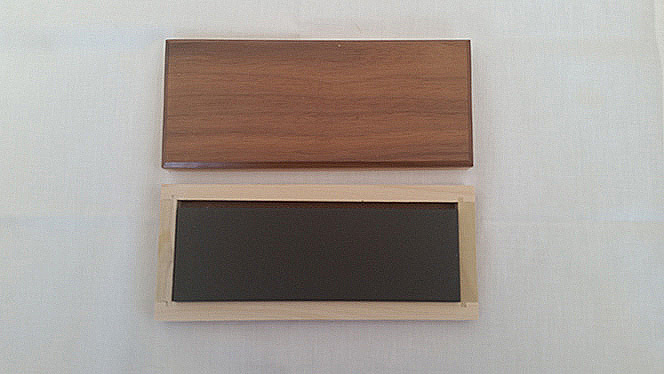 6" X 2" X 3/4-1"
8" X 2" X 3/4-1"
10" x 3" x 3/4-1" and 10" x 3" x 1/2" Genuine Arkansas BLACK (1200 grit) Novaculite Sharpening Bench Stone in a Beautiful Hand Crafted Hardwood Box. This Authentic ALL AMERICAN MADE Arkansas Whetstone will literally provide a lifetime of sharpening excellence for any size knife or cutting tool. Nothing compares to the quality of edge you can achieve with a REAL Arkansas Novaculite Whetstone. Accept NO substitutes! Buy with the confidence that you are purchasing the BEST ! 10' X 3" X 1/2"
10' X 3" X 3/4-1"
This (one) 3/4-1" Thick Soft Novaculite Sharpening Stone is the REAL McCoy! This is the Genuine Arkansas Soft Novaculite Whetstone mined ONLY from the Ouachita Mountain region of Central Arkansas. This is the finest knife sharpening material in the WORLD! This stone can put a quality edge on any blade. It comes in two sizes: one measures 6" x 2" x 3/4-1"; the other measures 8" x 2" x 3/4-1". Both come in a BEAUTIFUL Hand Crafted Cedar or Hardwood Box. If you are looking for the Best Quality sharpening stones that will last a LIFETIME, this is it! This stone is approximately 400 grit and makes a GREAT GIFT! 6' X 2" X 3/4-1"
8' X 2" X 3/4-1"
This 1/2" THICK Black Novaculite Sharpening Stone is the REAL McCoy! This is the Genuine Arkansas Black Novaculite Whetstone mined ONLY from the Ouachita Mountain region of Central Arkansas. This is the finest knife sharpening material in the World. This rare bench stone can put a surgical quality edge on any blade. 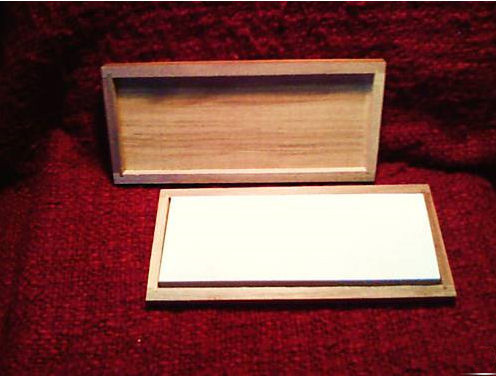 It measures 6" x 2" x 1/2" and comes in a BEAUTIFUL Hand Crafted Hardwood Box. If you are looking for the Rolls Royce of sharpening stones that will last a LIFETIME, this is it! Makes for a GREAT GIFT! Never lose a fish again due to a dull hook! Stone has a special groove for sharpening fish hooks. Comes with a 3" x 1" x 1/4" Soft Arkansas Novaculite stone specially grooved to keep your fishing hooks sharper than new in a beautiful protective leather case. Stone Size 3" X 1" X 1/4"